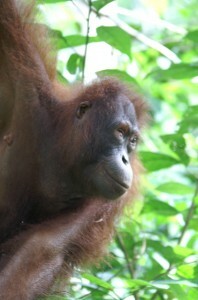 Since 1998 Angela and I have travelled many times to the wonderful and beautiful island of Borneo. In this blog I will be retelling some of the amazing adventures we have had over those visits. A single ray of sunlight pushed its way through the tightly drawn curtain. The room, like the thick garishly coloured curtains, had a musty smell and had seen better days. Built in the late 70’s the lodge was, at the time, considered state of the art but years of termite attack on the wooden cabins coupled with the daily torrential downpours had taken their toll. Surrounded on three sides by the ever increasing palm plantations that received regular dousing with insecticides the termites had moved to more lavish and infinitely safer surroundings. It was however clean and dry and served the purpose for which it was designed. A brief stopover for the traveller on route to the interior. Eco-tourism had found its way to Borneo although here it still had a way to go. Westerner’s perceptions of home comforts differ from those of the East. The traveller in search of adventure and wildlife expecting to find a fully air conditioned room with a flatscreen TV and bar will be sorely disappointed. The distant call of a gibbon resounded somewhere deep in the forest. The jungle chorus of a million unidentified insects began to sound in his ears. Rolling lazily on to his side he threw back the flimsy sheet and glanced at the small travel clock on the bed side table. 5.30 am. In true male tradition he instinctively checked that all was in order and stumbled over to the mirror. Stretching out his arms in a tired yawn he examined his tongue. It was a wonderful shade of green with a coating of what looked like the inside of well used kettle. The previous evening he had rather foolishly sampled the local green curry and then attempted to put out the fire in his throat with copious amounts of Tiger beer. Satisfied that this was probably as well as he could feel given the circumstances he stumbled into the shower room and was instantly pulled back into reality as the ice cold water hit his back. There’s a lot to be said for solar power unfortunately none of it applied here. A single cockroach perched atop the shower head deciding if it would be better to make a dash for safety or to simply sit it out and wait for this intruder to its kingdom to depart. As it happened the choice was made for it as the shower head kicked into life and sent it swirling in to the shower tray and down the open drain hole. Towelling himself dry he wrapped the towel around his waist and pulled back the curtains to let the early morning sun flood into the room. He quickly dressed and reflected on why he had actually made the arduous trip to Sabah. This was the culmination of two years research. His passion for insects and spiders had started has a child, continued through his teens and now as a 40 something he was on the verge of finishing his research. He and his wife had travelled 4000 miles on the strength of a description he had found in old well thumbed book found on the shelves of an equally old thumbed book shop. His research had turned up a photo e-mailed to him from backpacker who although not an expert certainly knew that what he had photographed was something special. Something very special! The road from to Sukau to Lahad Datu is long and straight but to describe it as a road would be stretching the imagination. It sprawled out before them in to the distance. Throughout his travels around the world he mused that he had never had the pleasure of such a bone shaking experience as this. He remembered his guide telling him at the beginning of the journey that with each trip one would receive a ‘free full body massage’. He certainly wasn’t joking. Despite the relative comfort of a 4 wheel drive with air conditioning he felt that he had been assaulted both physically and mentally. “How much further?” he asked, dreading the answer. Jamil turned from the wheel and smiled. “78Km…..road will get worse before it gets better” Was it possible this road could get worse? At that the 4wheel drive hit another huge crater of a pot hole and lurched from one side of the road to the other. The driver struggled to hold the wheel but seemed indifferent to fact that the vehicle had almost tipped over. Having travelled on this road before in 1998 he knew that after three hours the assault on his bladder would be too much to bear and at sometime soon he would be forced to ask the driver to stop. You arrive at Sukau by one of two means. A long but pleasant motor boat trip that hugs the green walled coastline before heading up river lined on both sides by trees where the proboscis monkeys sit and watch the seemingly endless passing tourists boats or by the road. Sukau is a small village in the eastern part of the Malaysian state of Sabah. It nestles quietly on the edge of the River Sukau a small tributary of the mighty Kinabatangan. It was a pleasant river side stop over that allowed tourists to become accustomed to the sights and sounds of the jungle. Ray was beginning to wish he had opted to leave Sukau as he had arrived, by boat. However he needed to get to Lahad Datu quickly to meet up with his guides and this was the most direct if not the most comfortable route. He was hoping to meet with guides that would lead him into the heart of the jungle. To one of the last pristine primary rainforests left on the planet. 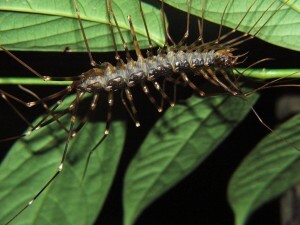 The Danum Valley where he hoped to find what he yearned since his youth…….the tarantula. In 1998 Lahad Datu was what one would have described in the old west as a “one horse town” One road in and one road out. It had a small airport with a single runway and a magnetic board that proudly announced that the plane would leave from Gate 1. As there seemed to be only two flights per day, both to Koto Kinabalu and Gate 1 was a patio door that opened on to the runway there seemed little chance of missing your flight. However, progress waits for no man and by 2006 the town had expanded rapidly. Now two patio doors waited for the weary traveller. The staff remained as indifferent as ever and the same pretty girl dressed in a crisp uniform that checked him in 1998 sat staring at him again in 2009. As the years had rolled by he had noticed an ever increasing security presence at the airport. A rather stern security officer stood, hands clasped behind his back, watching every passenger with suspicion. He placed his bags on the x- ray scanner and smiled at the young girl whose job it was to inspect the contents on the small screen. She smiled back and then having caught the eye of the guard looked away shyly. He felt the guard’s eyes burning a hole in his back as he picked up the bag and continued to check in. It was obvious that he had not broken a cultural tradition rather a simple case of jealousy. Lahad Datu now acted as a frontier town for the loggers who work deep in the jungle, the odd Philippine pirate and the awestruck backpacker on their way to the jungle. Mainly Philippine or Chinese in origin the locals are friendly if not a little wary of strangers and a number of hotels and small shopping centres had sprung up. We arrived weary and bruised but in good spirits and were met by our two guides. Both seemed a little apprehensive and chatted incessantly in Malay. After a good meal at a Chinese restaurant we felt refreshed enough to start the four hour journey into the interior. Our guides loaded the truck with my back packs and we were off. After a few kilometres one of the drivers began to question us. “No” I answered again “We are looking for spiders”. “Labah Labah” he muttered to his colleague. There followed a brief conversation in Malay and then furious laughter. “My friend says he has many in his house you are welcome to them all”. It seemed arachnophobia is a world-wide phenomenon. After 50 km or so the truck veered off the main road and headed west on an old logging track. The Danum Valley is owned, believe it or not, by a logging company who set it up as a protected area after discussions with the government. 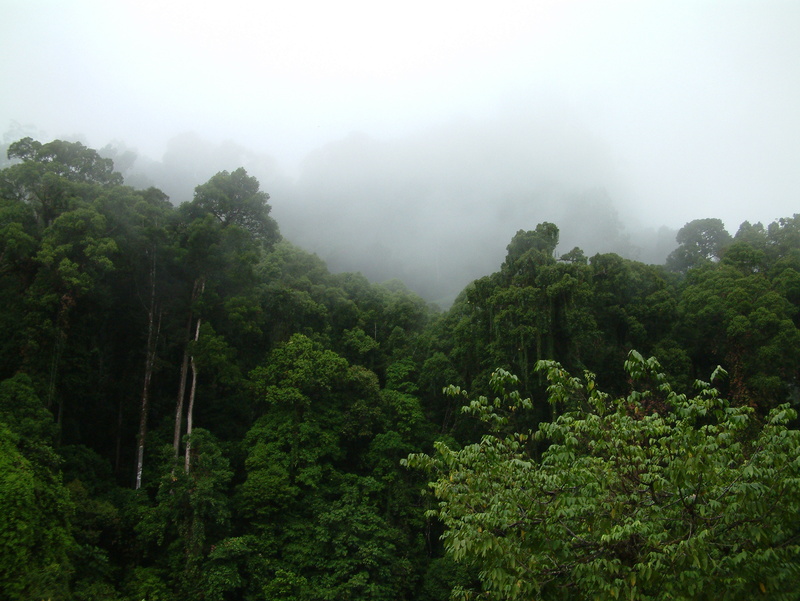 Nevertheless irrespective of their reasons the Danum is one of the best protected areas in Sabah. After two hours of driving through decimated forest replanted with palm oil trees we arrived at a checkpoint. On my first visit this had been nothing more than a hut with a barrier and guard. It had now expanded into a small community of loggers. It seemed that the saws crept ever closer to paradise. With a smile and a wave we passed into the Danum Valley and found ourselves in a lush green forest. The vehicle crawled ever inward occasionally pulling over to let one of the huge logging trucks past. Each truck carried at least 10 trees all with a 6ft diameter. These guys had no brakes and they had no intention of giving way even if they had. They were a painful reminder that logging was still going on even this deep into the jungle. The afternoon sun was hot and despite the cool air circulating in the vehicle the temperature was still oppressive. I was saddened at the destruction of the forest and the depth that the loggers had penetrated into the interior. One should not of course blame the loggers entirely as it is the west’s insatiable craving for hard wood and the palm oil that replaces the forest that plays a large part in their destruction. We arrived at the Lodge around 2pm and was met by a smiling Malay girl who offered us a fruit drinks and showed him to the bar area. It was as he remembered. This lodge unlike his previous night’s accommodation was made almost entirely from the Ironwood trees and was built to last. One could see why hardwood was in huge demand in the West. I fell on to the large bed in the comfortable surroundings of the lodge and closed my eyes, the ever present sound of cicadas filled my ears and I breathed deeply taking in the aromas of the forest and filling my lungs with pure fresh air. Since our last visit the accommodation had been radically updated. External Jacuzzi baths had been added to the rooms and the ensuites had changed from a plain white tiled shower room to a beautifully appointed luxurious mecca. My enjoyment was short lived as Angela excitedly called me to the balcony. I strolled onto the wooden slated terrace and looked out across the fast flowing river below. There in a tree about two hundred yards away sat a true wild Orang-U-Tan busily preparing its nest for the approaching night. The clouds were gathering and the rain began to fall. At first a few solitary spots hitting the face as if to give you fair warning of the oncoming torrent. The sky turned dark and the heavens opened. The rain was torrential, hitting the tin roof with a deafening thud. It ran down the roof and quickly overwhelmed the wholly inadequate guttering. It poured over the edge and ran in streams along the paths down to the rising river. Then just as it came the rain had gone and silence fell on the forest again. Steam rose from the tree tops and the sounds began to slowly return. 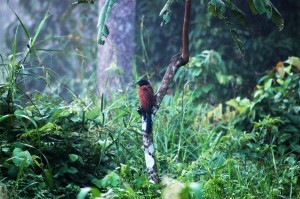 Firstly the high pitched cicada followed by the birds and finally the gibbons began to call. Our new friend sat nonchalantly throughout, holding a large leaf over her head and chewing on a large durian fruit. She had seen this many times and knew the drill. She turned her back and continued on her task. The evening was drawing in and she had much to do before dark. The problem or perhaps benefits of looking for tarantulas or indeed most arachnids and insects is that they are, in the main, nocturnal so whilst those around you are busily following the various trails around the forest and excitedly snapping photos of hornbills and gibbons you find yourself relaxing in the bar awaiting the night. As dusk arrived we busied ourselves preparing for our evening forage. Flashlights, collecting jars and camera all neatly packed into a shoulder bag. Leech socks tightly secured, T-shirt tucked into trouser tops and the ever present essential buff around your neck. We set off down the path past returning trekkers and soon found ourselves deep within the forest. The first thing that is obvious in a rainforest at night is the lack of light. In the west we become so used to light pollution that we forget how dark this planet is when the sun sets. Looking up at the black sky our eyes soon adjusted to the lack of light and we suddenly found ourselves standing beneath a canvas of stars. Millions of tiny lights appeared to us and I found myself gasping at its splendour.